Version History of Viobo MySQL to MSSQL Data Migrator - migrate data from MySQL to MSSQL easily! Viobo MySQL to MSSQL Data Migrator can migrate seamlessly from MySQL data to MSSQL data. The user-friendly interface helps users operate the data of databases easily and view its effect in real time. The Users can also backup the data of different kinds of database system into Data-Files with the uniform format in directory named BACKUP in the modulpath, including Text-file, etc. 2. Add Extern Multi Sessions. 4. Add Supporting to Mysql enum data type. 1. Modify 'Backup' to 'Export'. 2. Modify several Bug of version 1.5. 3. Modify Date Format in Log. 4. Modify the data size limit of 8K to 64K. 5. User can choose Source/Target Side DB to test/connect. 1. Add Database Connector, Driver or Provider auto check. 2. Add help to install Driver from local. 3. Add tcp/ip:port connect mode. 4. Improve the save structure of backup. 10. Limits of Trial Version that max. 200 records per table improve to 1000. Viobo MySQL to MSSQL Converter 1.0 is the old version of Viobo MSSQL to MySQL Data Migrator, you can still free download (5.11M) and buy now. 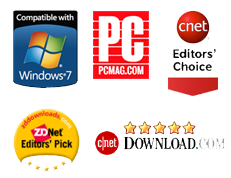 System Requirements: Support Windows 98/Me/2000/NT/XP/2003/Vista/Win7; Intel PII processor or above (P4 or K8 is recommended); 128Mb of RAM or above. 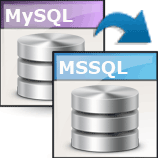 -- MSSQL To MySQL Data Migrator is one data migrating tool for database MSSQL to MySQL. -- MySQL To MSSQL Data Migrator is one data migrator software for database MySQL to MSSQL. Viobo Studio are specialized in developing tools for databases. Copyright © 2009-2011. www.viobo.com All rights reserved.